Perhaps no fishing experience requires greater attention to gear than ice fishing. Not only do ice fishermen need to deal with harsh and bitter temperatures, but the surrounding weather conditions often bring snow, sleet, and of course, ice. Luckily, ice fishing rods have recently undergone a vast array of modifications and upgrades, particularly within the past ten years. The increased versatility of ice fishing rods includes fast action tips and the ability to hold heavier line weights, two significant improvements that have more and more anglers transitioning to ice fishing. While increased options can provide a wider pool of ice fishing rods to choose from, they may also make choosing the best ice fishing rod a little bit more complicated. Thankfully, by looking at the top-rated rods, anglers can quickly and easily learn about the key factors to search for when thinking about their own ice fishing rod. Graphite reel comes pre-spooled with 8lb. When looking for the best ice fishing rods, anglers will find that manufacturers often combine fishing rods with reels, creating ice fishing combos, rather than independent components. Still, there are plenty of ice fishing rods that can stand alone as top-quality, premium rods to invest in. This review has compiled a list of the five top-rated ice fishing rods that are currently on the market, to assist anglers in finding the best ice fishing rods for them. Shakespeare’s Ugly Stik rod is consistently a top-rated piece of fishing equipment, so it's no wonder that their ice fishing rod has also earned great customer reviews. The original Ugly Stik blank is one of the toughest and most durable blanks available, making it a particularly good option for ice fishing. With three different size options, this ice fishing rod offers great versatility for a variety of ice fishing uses. With the combination of the spinning reel, the Ugly Stik GX2 Ice Combo makes ice fishing a little bit easier. The spinning reel contains a ported aluminum spool, enhancing durability without having to sacrifice a lightweight feel. The larger sized reel also allows for greater amounts of fishing line, allowing for an overall quicker and more efficient drop into the water. This ice fishing rod also comes with a twist-lock reel seat, which ensures that the reel stays in place. The tip of the rod also comes with high sensitivity, making it easier to sense exactly when a fish has begun to nibble and bite. 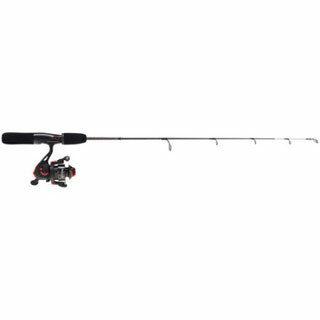 A combination of high quality and affordable price makes the Shakespeare Ugly Stik GX2 Ice Combo the perfect option for anglers who are looking for an ice fishing rod and reel that can stand up to harsh conditions and tough fish. The compact design and ultra-light nature of the Piscifun Ice Fishing Rod both make it a perfect option for those who are planning on backpacking, camping or traveling. Though the rod can split into two separate parts for easy transportation, it is also flexible enough to nearly bend in half without breaking. Not only does this make for durable transportation, but it also makes for a durable rod to withstand heavy winds, as well. At 23.6-29.5”, the Piscifun Ice Fishing Rod is notably smaller than other ice fishing rods, but still, performs like its more robust competitors. The graphite rod blank allows for enhanced flexibility, while still preserving overall strength. By limiting stainless steel components to the line guides, this ice fishing rod manages to maintain its lightweight nature, ranging between 2.68 and 2.79 ounces. For ice fishermen looking to capture small to medium-sized fish species, this ice fishing rod is not only incredibly portable, but it offers great performance, too. Don’t be dissuaded by its compact nature: reviews rave over its ability to reel in bluegill and bass consistently. One of the best features of the Fiblink Graphite Ice Fishing Rod is that it manages to combine a sensitive rod tip with a solid backbone, enhancing the overall performance of the rod. 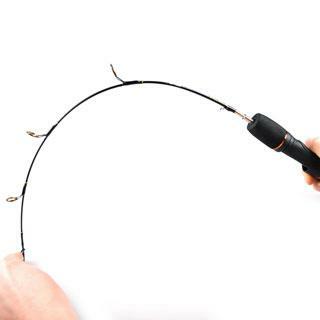 Anglers will be able to feel nibbles and bites much sooner with the sensitive tip, while the body of the rod remains sturdy and strong enough to bring the fish in. The solid cork handle has been specially formatted for long-lasting comfort, offering a smooth and easy grip. This decreases hand and wrist strain, making for lengthier and even more enjoyable time spent out on the ice. 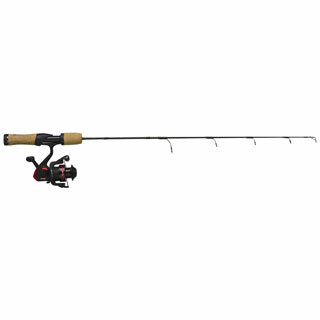 Each model comes with varying power specifications: the 24" rod offers ultra-light power, and the 30" rod provides medium power. With a combination of sturdy aluminum oxide guides and graphite rod blanks, this ice fishing rod is just as durable as it is lightweight. With the Lightning Rod Ice Fishing and Reel Combo, Berkley proves that lightweight doesn't have to mean fewer features. The solid fiberglass blank provides extra protection against wear and tear, ensuring that the rod can be used for years to come. The oversized line guides are particularly resilient, as their larger size keeps the guides from freezing up under cold temperatures. A cork handle grip allows for the absorption of heat, making it much more comfortable to hold the rod amidst bitter weather conditions. Additionally, it also creates a more ergonomic feel, which all anglers will certainly appreciate. 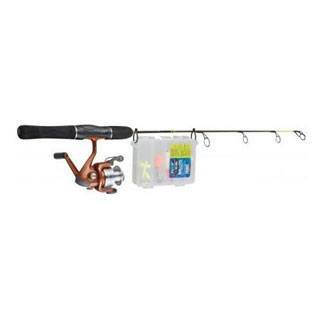 Anglers can choose from three different sizes and power categories to suit their ice fishing needs: 24", 28", and 32". 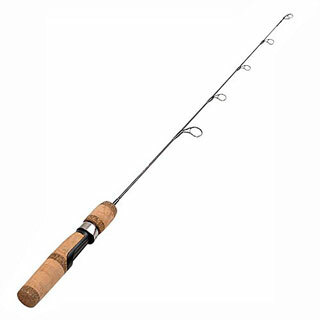 The 24" rod offers ultralight action, which the 28" comes in either medium-light or medium power categories. For those who are looking to snag bigger and more powerful fish while ice fishing, the 32" model offers medium-heavy power. As an ice fishing rod combo, the Celsius R2F package certainly packs a punch. For anglers who are just beginning to gather materials for ice fishing, the reusable tackle box comes with everything that you will need. Not only are a medium and large jigger spoon included, but anglers will also receive six hooks, one large slip float, two beads, and one depth finder. At 27” and a fiberglass blank, the Celsius R2F ice fishing rod is suited for medium to heavy power application, making it one of the most versatile ice fishing rods. Anglers can not only catch smaller fish with ease, but they can also be prepared to reel in larger fish species if need be. For anglers who are looking for an easy transition into ice fishing, the Celsius R2F Ice Combo not only provides a great quality rod, but it also offers a broad range of necessary equipment, allowing for quick and easy application on the ice. The most common classifications for power range between ultra-light, light, medium, and heavy. When ice fishermen talk about the strength of the rod, what they really mean is how much force it takes until the blank starts to bend. Depending on your own fishing preferences and habits, you may want a rod that bends very easily, so that bites and nibbles are caught sooner. Power and fish species are very closely intertwined, as some power levels work best with certain fish species. Ultra-light ice fishing rods are great options for anglers looking to hook panfish, while light rods are best suited for perch. Medium rods have enough power to handle walleye, whitefish, and most trout species, while heavy rods are best suited for lake trout or pike. Choosing the right rod—or blank—material is an important aspect of finding the best ice fishing rod. The most common options are graphite and fiberglass, though they will each have their own unique benefits. Graphite rods tend to be much more sensitive and lightweight, making it more expensive overall. Fiberglass is more durable than graphite, as it is less sensitive to cold temperatures. It is also much more flexible when compared to graphite. Rod material can make a big difference in choosing the best ice fishing rod for your needs, depending on the application and the environmental conditions. Whether you are planning on jigging for a few hours or spending all night on the ice, having the right ice fishing equipment is key. Purchasing a high quality ice fishing rod can give anglers an advantage on the ice, offering various levels of features and advances in fishing technology. Examining the top-rated ice fishing rods can provide crucial insight into what components are best-suited for fishing during harsh, bitter weather conditions, including construction, length, application, and power.